It has turned out to be a pretty remarkable February, weather-wise, throughout most of California. A prolonged period of wet, unsettled, and pretty cold conditions have brought widespread heavy precipitation to the state, focused especially on the central and southern regions. Some flooding has resulted, but in general these rains have been largely beneficial. Particularly notable was the extremely heavy precipitation (and associated widespread flooding) that last week’s atmospheric river brought to the high deserts of SoCal. In fact, Palm Springs received one of its wettest days on record (in any month!). This February has also been a pretty incredible month in the Sierra Nevada, where a phenomenal amount of snow has fallen over the course of just a few weeks. Some of the highest peaks in the southern Sierra are nearing record snowfall totals for the month of February (though not, interestingly, for the season to date)–and quite a bit more will fall before the end of the month. While travel conditions have been extremely hazardous (and, at times, impossible) in recent days, this prodigious snowfall is excellent news for skiers and drought-stressed conifers alike. 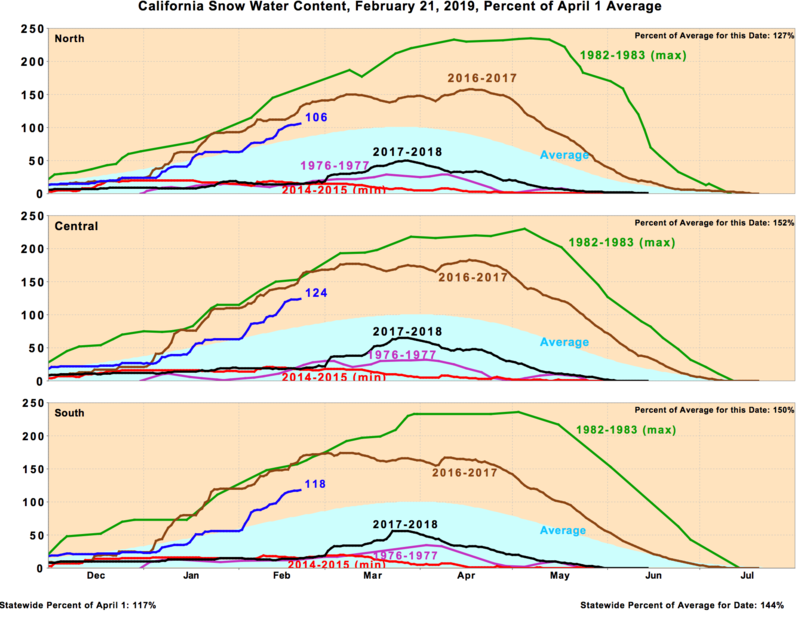 Up through this weekend, the state stands at 144% of average snow water equivalent–an impressive number, though still a fair bit behind the banner 2016-2017 season and even further trailing the epic 1982-1983 season. Meanwhile, persistent Alaskan blocking and the legacy of the January Polar Vortex displacement allowed a very cold airmass to bring extremely low elevation snowfall in several parts of the state. Most notably, Redding (in the far northern Sacramento Valley at ~500 ft elevation) experienced one of its heaviest snow events on record, with nearly a foot of accumulation! (This set-up was made possible by unusually cold air trapped in low levels of the atmosphere, which remained in place despite the northward movement of much warmer/moister air aloft in advance of an atmospheric river). And even more recently, isolated flakes fell down to near sea level as far south as Los Angeles last week, with more significant accumulations in the coastal hills as far south as San Diego! Interestingly, daytime highs during this event were only moderately below average for February–highlighting the critical importance of extreme cold in mid-levels of the atmosphere and the remarkable ability of atmospheric deep moist convection (i.e., tall cumulus clouds and showers/thunderstorms) to briefly bring cold air from aloft down to near the surface. Finally, it is interesting (as a matter of perspective) to note that despite all the recent low elevation snowfall (and even a handful of daily record low temperatures), the Water Year to date has still been substantially warmer than the long term average across most of California. 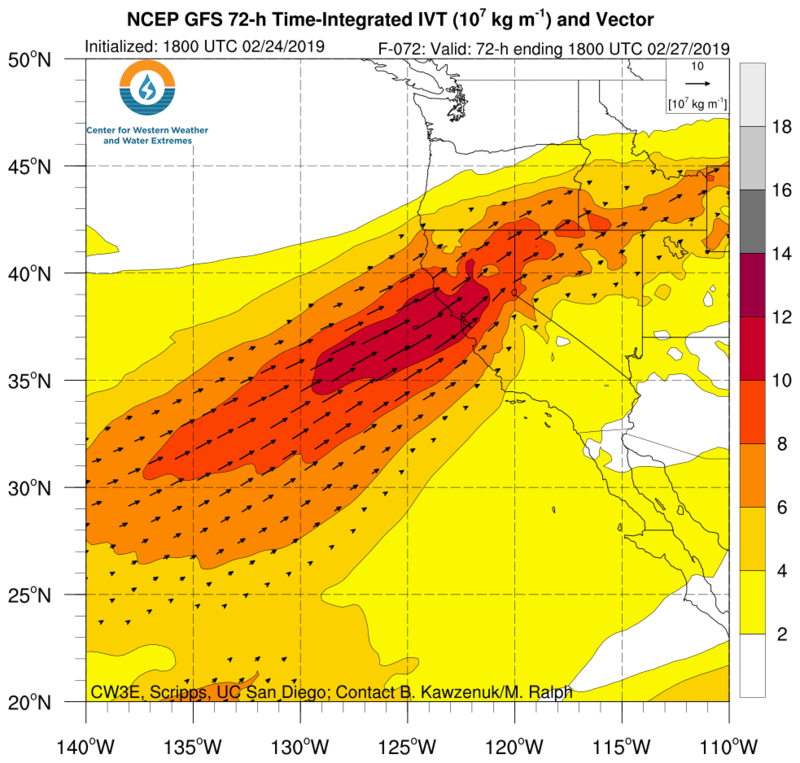 A pair of atmospheric rivers will take aim at Northern California this week, and will likely deposit more than a foot of liquid in the typical wet spots (and several feet of snow at the highest elevations) before all is said and done. Neither of these systems looks especially powerful from a dynamical standpoint–meaning that widespread damaging winds and/or thunderstorms appear unlikely. 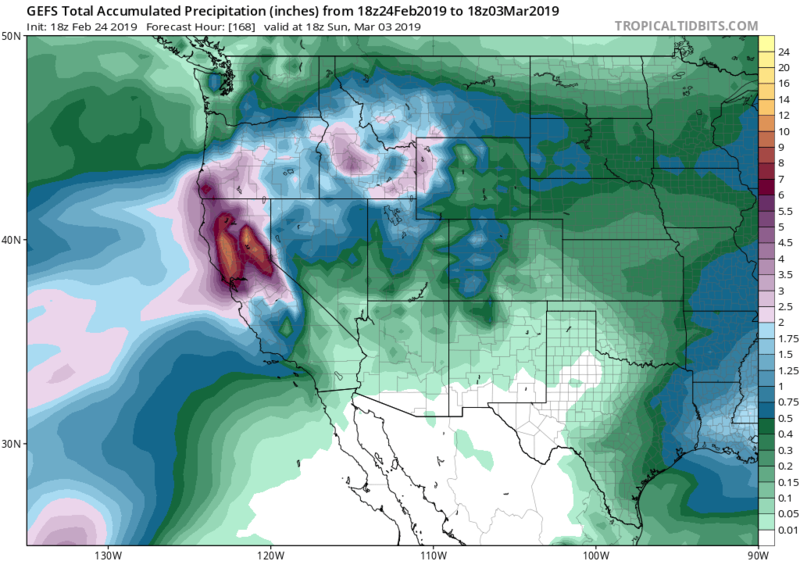 But the big caveat here is that both of these ARs will be very persistent and slow-moving–likely lingering over NorCal for multiple days and possibly stalling over a handful of watersheds. Integrated vapor transport (IVT) diagnostics suggest that this week’s event will probably be a “category 3” (out of 5) on the new AR intensity scale developed by Scripps (for reference, last week’s was a solid 4). But as I’ll discuss briefly below, the impacts may be elevated relative to what might otherwise be expected given the very wet antecedent conditions, which have saturated soils and left rivers running high. SoCal is unlikely to see heavy precipitation from either of these events (indeed, the heaviest rainfall will mostly stay north of San Francisco). All of the NorCal NWS offices have issued long-duration Flood Watches for the coming week–certainly understandable, given the possibility of a moderately strong AR stalling out and the saturated soil conditions. Precipitation probably won’t fall at extreme rates, but will add up considerably over several days. Widespread flooding of smaller rivers and streams is likely at times this week–but right now this flooding does not appear to be severe in magnitude. It’s important to keep in mind that minor to moderate flooding can be expected on most river systems every couple of years; which appears to be the most likely outcome this week for most of NorCal*. However, stalled atmospheric rivers are always a bit of a wildcard–and localized impacts on a handful of smaller watersheds could be higher. *Unless the ARs arrive stronger or last longer than currently anticipated–which is a possibility. Also, there are currently indications that additional significant precipitation could follow next week after a weekend reprieve. If that happens, there is the possibility of more significant hydrologic issues 7-10 days from now. Stay tuned!